Not even I expected the outcome of this film and for that reason, I thought it was a great story that didn't have any characters with plot armor. Cast: Christian Bale, Rosamund Pike, Wes Studi, Rori Cochrane, Jonathan Majors, Jesse Plemons, Adam Beach, Tanaya Beatty, Q'orianka Kilcher, and Xavier Horsechief. 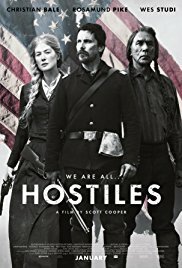 Pros: Hostiles was brutal and by that I mean not everyone makes it out alive and that was surprising. I liked seeing Christians Bale's character "Joseph" change from hating Native Americans to having empathy for them in the end. Seeing the old western story come to life is something we don't see often in film now adays and it was a good refresher. We need to tell more stories like this on the big screen. Performances by other cast members helped in the development of the story. Rosamund Pike was a great addition and flourished only after being on the journey with Joseph. Seeing Wes Studi as Chief Yellow Hawk made this journey possible to begin with. Having him change Joseph's view that not all Native Americans were bad was a big impact even though he did wrong in the past too, time can heal and change a person. Cons: A friend of mine pointed this out and it makes sense but Joseph having a whole bag full of reasons to hate indians softened pretty quickly throughout the films journey and I brought up traveling all that time would be weeks so maybe his heart would of been softened but it would of been nice seeing a time lapse of some sort to follow along. Rosamund Pike's performance in the beginning of the film was hard to watch in my opinon but I enjoyed her more when she was on the journey alongside Joseph. Minor Characters dialogue could have been cut out because the length was a little too long. There's some other movies out there that might catch your eye but seeing an old western with great actors is one not to miss so check it out. The last installment of the Maze Runner series did not leave any stone unturned. It ended with a worthy conclusion for a young adult adventure novel. Cast: Dylan O'Brien, Ki Hong Lee, Kaya Scodelario, Thomas Brodie-Sangster, Dexter Darden, Will Poulter, Rosa Salazar, Giancarlo Esposito, Patricia Clarkson, Aidan Gillen, and Barry Pepper. 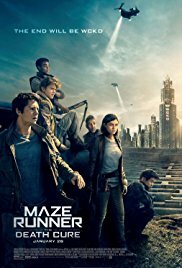 Pros: Story was a lot better than the previous film (Scorch Trials) and in my opinion, the slow parts of this film filled any questions you might have had about the storyline. Dylan O' Brien is becoming one of my favorite up and coming actors to watch out for, he has grown from being on MTV's Teen Wolf to so much greater in the film industry, he was a great selection to play Thomas in this series. The rest of the cast, even though minor main characters ended this movie with a bang. The ending was action packed and left me on the edge of my seat. Seeing both sides of finding the cure made this more realistic with it being a real problem if not solved. Cons: What can I say without spoiling? The ending is tough because not all of the beloved characters we know make it out alive and although that helps a movie and story it was something I wasn't expecting. I was hoping everyone would have made it. The Death Cure was long so I only put that as a con because some of you might not like it, but it did fill in plot holes so it sort of had to be. I never read the books so I have no idea what was added or taken out but I sure did love this series and this third installment was a great ending in my opinion. Go check it out and be entertained.